For those players used to Modern Warfare 2’s constant barrage of XP bonuses and level-ups, ranking up in Battlefield Bad Company 2 can seem a bit mystifying, and after a while frustrating. The key to understanding the leveling system in BF:BC2 is to remember that the game emphasizes teamwork at every stage. Many of the best point bonuses come not from killing enemies but completing objectives and supporting teammates. 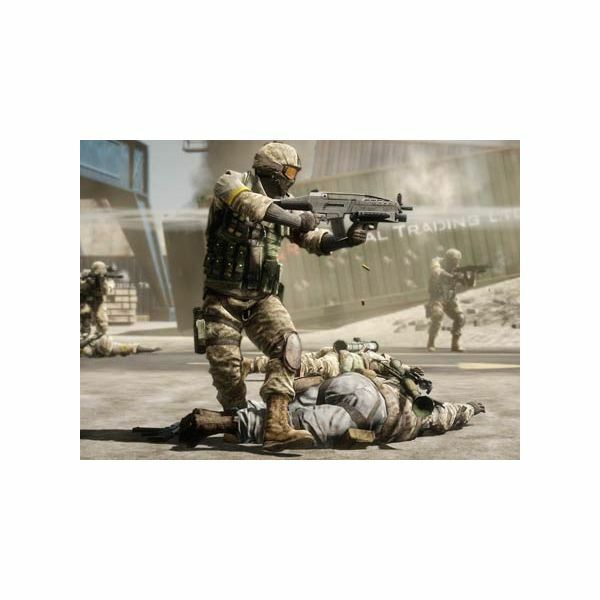 In this guide to how to rank up fast on Battlefield Bad Company 2 online, we’ll provide you with a selection of Battlefield Bad Company 2 rank tips, show you which is the best class to get ranking up fast early in the game and unlock better weapons and kit, and the best point bonuses on offer in Battlefield Bad Comapny 2 multiplayer games. The number one tip for ranking up quickly in BF:BC2 is to always remember that lone-wolf tactics simply don’t work in this multiplayer game. You are not a one man killing machine, and, worse, even if you’re good with a gun, you won’t be accessing the best point bonuses, so ranking up will be painfully slow for you. Join a squad, and base your gameplay on supporting your teammates and completing objectives such as defending flags or arming M-Com stations, and you’ll soon start to see the bigger point totals roll in. Because the leveling system in Battlefield Bad Company 2 is biased towards actions that support teammates, the best class to get your rank up rapidly during the early part of the game is the Medic. This may seem counter-intuitive, as the Medic doesn’t unlock its most important pieces of kit, the med-pack and the defibrilator, until after you’ve ranked up a couple of levels. But the initial wait is worth it, as once you’re in possession of these items, you can start to blaze through the ranks even without killing a single enemy. If you look at the chart of the best point bonuses below, you’ll see that reviving a team mate scores the same points as a kill, and sticking with your squad members and reviving them gives an even bigger bonus. Ensure you are liberally dropping med kits for your team mates at the main choke points as well, and you will find the big points totals and rapid ranking up will soon follow. Objective Damage (+50): Inflict 25% damage onto an M-Com Station. Destroyed Objective (+100): Finish the destruction of an objective. Killed Enemy (+50): You may get related bonuses for headshots, etc. Revive (+50): As a Medic, revive a teammate. Squad Revive (+80): Revive one of your own squad. Squad Passenger Assist (+50): Be on board the same vehicle when a squadmate makes a kill. Tracer Dart Planted (+30): You can plant tracers on enemy and vehicles and even infantry themselves, and then get a related bonus when a teammate damages them. As this chart shows, the points on offer for team and squad related support actions far out-weigh the bonuses you get for taking out enemy soldiers. Keep this fact always in mind when playing Battlefield Bad Company 2 multiplayer. Ranking up in Battlefield Bad Company 2 is all about playing smart. Support your teammates, spot enemies, heal and resupply, and most of all focus on your team’s objectives and you’ll soon find yourself swiftly rising up the ranking boards, and unlocking the better weapons and more powerful items. If you’r struggling to learn maps and gameplay, take some time out, watch some Battlefield Bad Company 2 commentaries videos and absorb the lessons. Then go back and apply what you’ve learnt to the battlefield. In Battlefield Bad Company 2, every soldier is simply a cog in the machine – it’s up to you to ensure that you’re the best cog you can be. 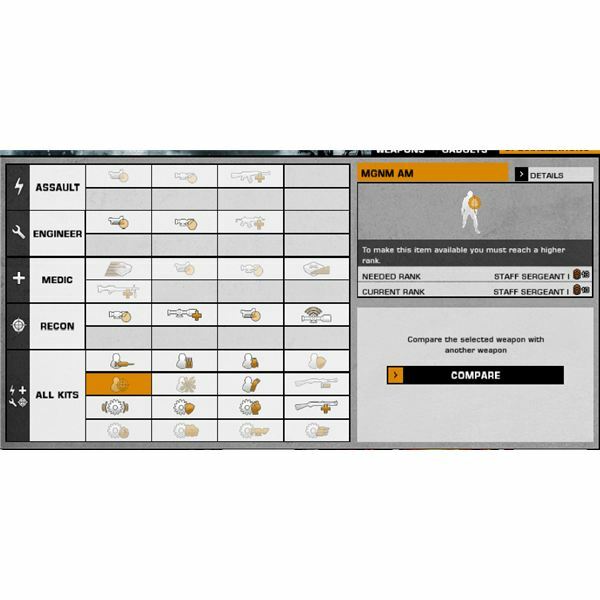 Our complete guide to unlockable weapons, gadgets, and specializations in Battlefield: Bad Company 2 includes information on all the great guns available for the Recon, Medic, Engineer, and Assault classes, as well as the vehicle specializations and weapons/items that are unlocked by raising rank.